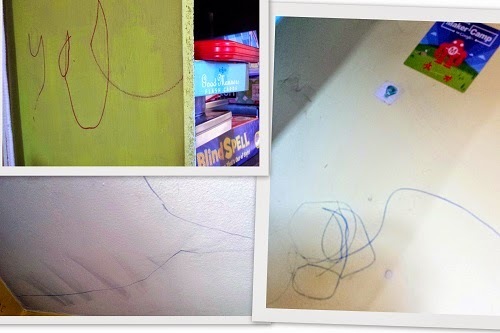 Why give markers to kids when they might scribble on your walls or their face? It's kind of like the argument we make for technology. Why give kids phones? Why give them iPads? Do they need this? But seriously, why would I ever give my kid a marker anyway? In my day, they were awful. They stunk. They discolored everything around me and I could never cover a large surface with a marker. It would dry up as I was using it. But it is 2014 now and markers are great. They even have "multi-cultural" colors which is terrific but still, horrible things can happen with markers. Some of these photos are the AFTER photos after #1 tried to scrub it off. We made him do it. Today's markers come in different colors, sizes, shapes, and even scents. 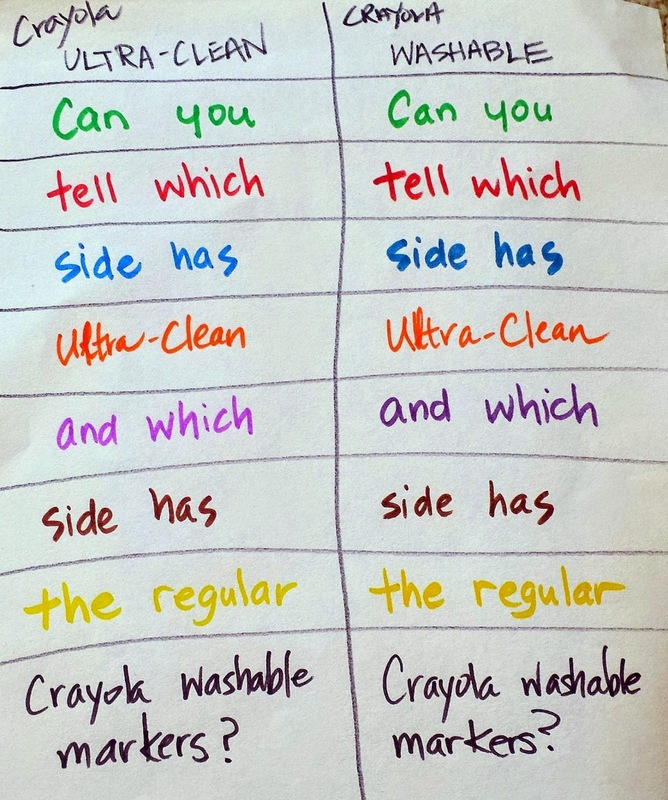 Still, we only look at them for use mostly in two areas, for preschoolers and adults who must mark clothing, containers, and boxes. However, in the past few years, I have seen markers go through a redefining process and luckily, it is all very good news! Honestly, I never thought washable markers were terrible to begin with but we all know that there is still room for improvement. 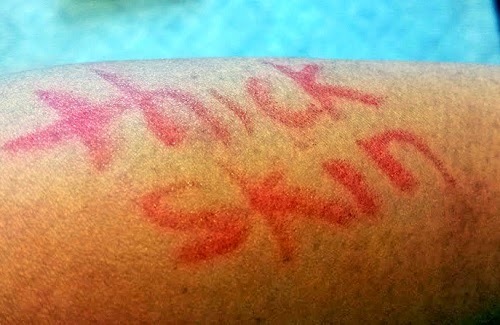 So like a child, I decided to walk around my house and start marker-ing up the wall, my clothing, my skin, the refrigerator... It was fun. I did it in secret places where my kids would not look because they would start thinking that it was okay to use the entire house as their canvas. Then I left it there.... for months (except my clothing and skin). The results were very good. When doing immediate or next day wash off, everything disappeared so quickly. Even the drawings that I washed off after letting it stay on my walls for months washed off, except for red. But again, that was after months of being there. Obviously, we would all wash off wall markings rather quickly. It washed away clean. No problem. Washed away clean after months of being on the wall. It came off right away in the shower. Yup, that is the floor of my apartment. Spinbot works best on flat surfaces. Why use paper? The fine line marker writes really fine. Did you guess right? I only see a difference in the purple markers. 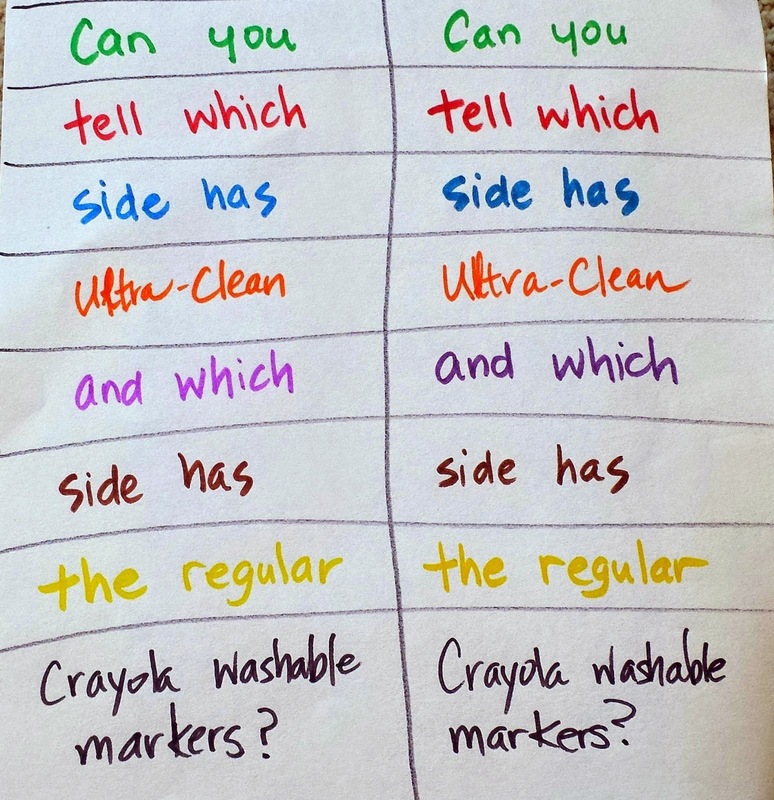 This might be the go-to markers for your older elementary child... all the way to high school. Your Connector Pen will never dry out. You can just dip in water and it is good again. No joke. It is washable too but I wouldn't face paint with them. So you can revive a dead marker, now what? Well.... You can use your markers freely without worrying and that can pay out big in the creativity department. Also, you can lose the marker cap for a few days without making a makeshift one until you find it. And best of all, these caps are connector caps, so you can make crazy things with it. So it is a toy as much as it is a tool. This is by far, one of the coolest birthday gifts you can give. Can they be called "Educational Markers"? Yes, they can. The new design helped me to get my kids interested in what I saw in the insert of the marker container. Who reads these? I never read inserts but this one... this one was different. They briefly explain to you what are the various ways this marker can be used and these are all such new techniques! Pointilism, Patterning, Squiggling, Contouring... It can help you really get excited about markers. 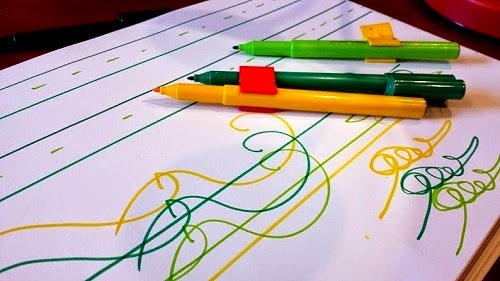 Using these techniques are specific to fine line markers like the Connector Pens. And these pens can do the job because they have strong... very strong nibs to hold up to making lots and lots of dots. 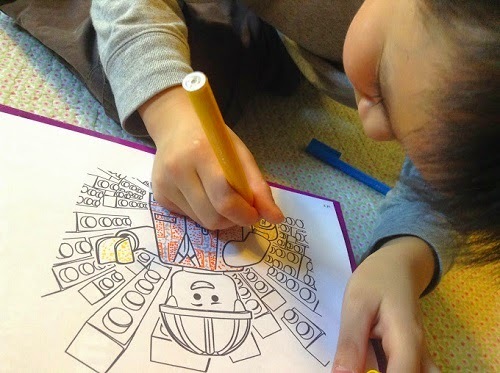 I can't tell you how many markers my kids have ruined because they wanted to make lots and lots of dots. BANG, BANG, BANG!!! Well, you can't bang on these either but serious, we have made a lot of dots and things are good. Moreover, if you happen to have a child whose handwriting looks like he's angry (really dark thick pressed-down lines), then these connector pens can be helpful because they are less ruin-able that way. Isn't that neat? We are working on making dots like these but until we can, here is a screen shot from a teaching video. Would You Like Free Art School? School is free but art classes after school are not. 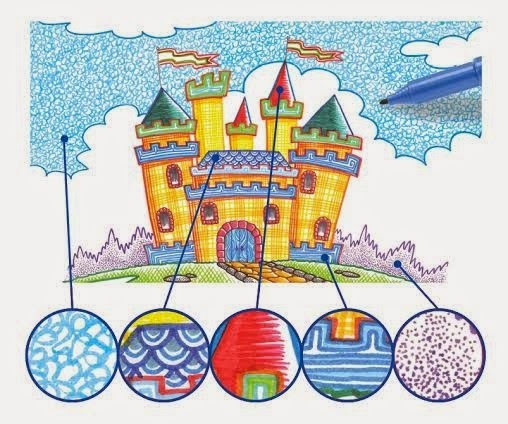 As your kids get older, they may want to receive more art instruction and if you can't afford it, Faber-Castell is a globally recognized art supply maker and so you will be able to see what others are doing with Faber-Castell pens from all around the world by going on YouTube. You can also see a wide range of tutorial videos on their site. There is no need to start from a blank page if you want to practice a technique, use a coloring page from the internet. 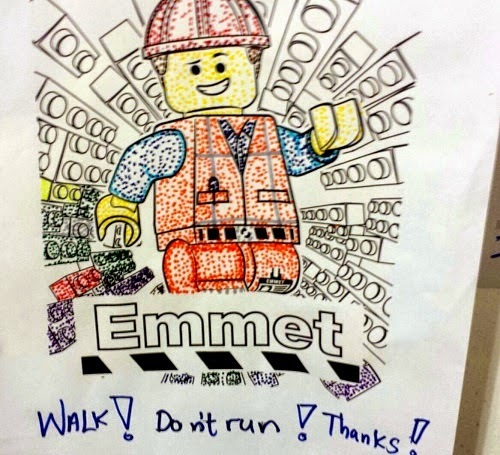 LEGO can be very motivating. Really, he didn't kill this marker with the pointilism technique Unbelievable. Can this make a bunch of lines evenly spaced? Yes, but it wasn't easy. You can connect but then they move around which is kind of cool in that way too. . Deep rich color to do finely detailed work. 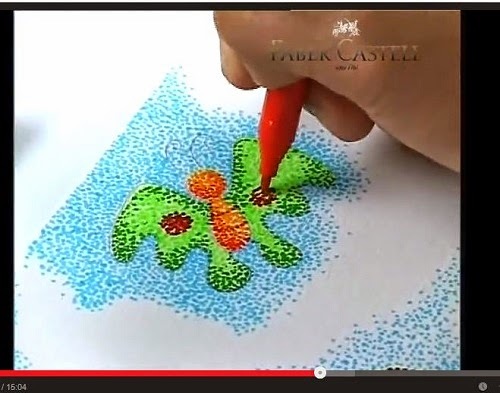 This young lady was just four years old when she learned pointilism, thanks to Faber-Castell. Having kids make their own reminder signs is just super sweet (for me). A bunch of markers on the table need not be cleaned up. It can just be its own little sculpture. Do We Really Need these State of the Art... Markers? Perhaps no one really complained about markers before. 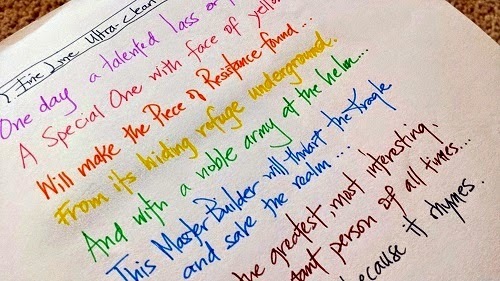 But the great thing about markers is simply this: they were made to glide across a page. They are made to give children and easier time to create. While we don't want our kids having everything easy, the point is, that sometimes, we can be surprised when we eliminate just one hurdle. It's like the difference in what a calculator, a pair of glasses, and yes, even, what a good deodorant can do for the average person. It's a tool to help you get something troublesome out of the way so that you can reach new heights while having a lot less worry and a lot more fun. Do I need that? Having fun is a need, especially for kids. After giving the Ultra-Clean markers to younger testers, I bought a set for me even though my kids are older and less likely to mark the walls. Like we still have erasers for our pencils, right? And our connector pens.... those pens will be here for a long long time. I wish kids would use that for handwriting practice. 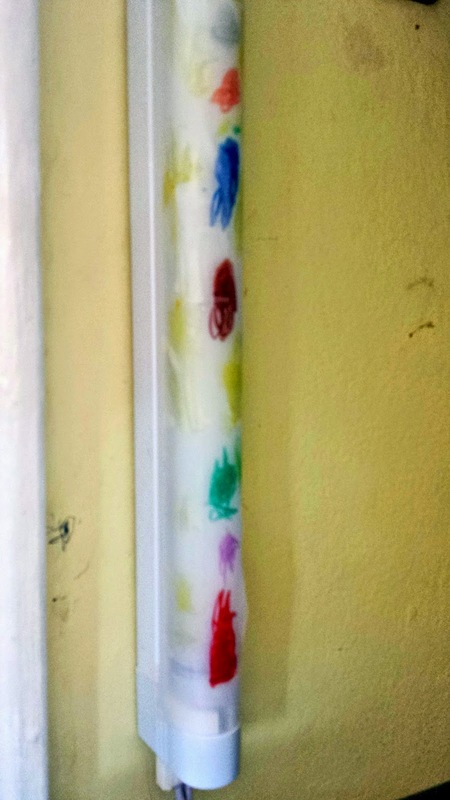 My kid put scotch tape on top of his lamp by his bed. He decided to use markers to make it multi-colored. He didn't ask permission. Some kids have an idea and just run with it. 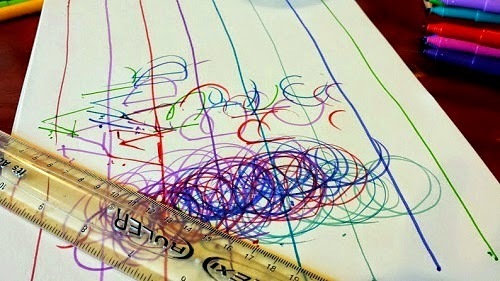 Markers help kids like that. Crayons wouldn't work here. Neither would paint. I almost died when #1 made this for me. 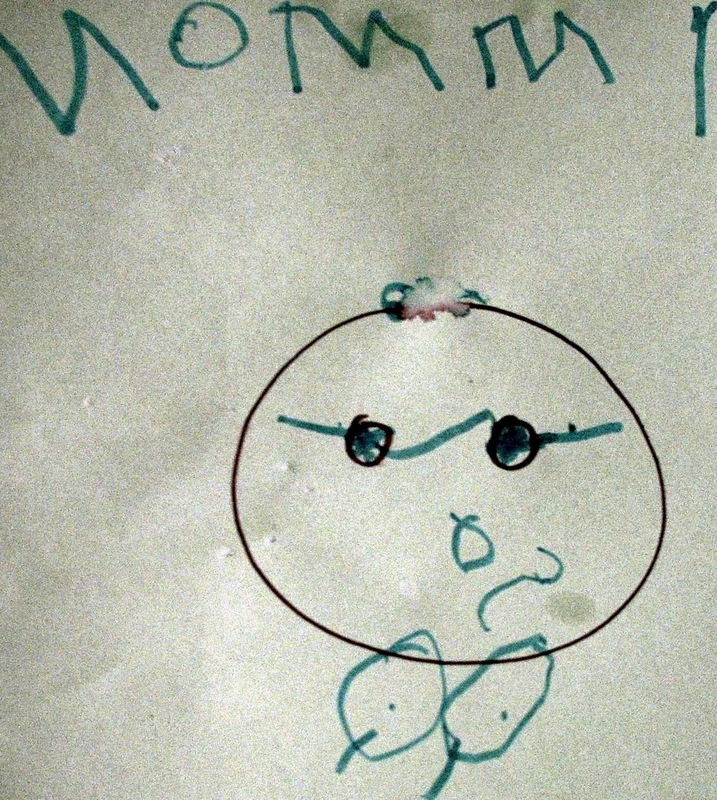 (I used to wear glasses) He was three at the time and yes, you are right to think you are seeing what you are seeing. I was breastfeeding our little guy at the time. Can you believe this kid? Like I said, markers help kids do amazing things. I would just like to say that my hair never looked like that. USE Rafflecopter to win your own supply of state of the art markers! My daughter would love to try these techniques! love that Faber Castell has project ideas on their site! 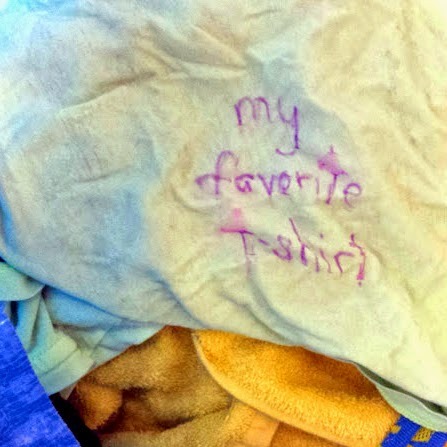 My kids usually do use washable markers so this would be fine. I like the true sketching set on the crayola site. Some day I am going to go through them all.... someday! Great comment! thank you! My kids would love to try out these markers. They're always disappointed when the marker goes through the page. They haven't tried pointillism, but that looks like a lot of fun! 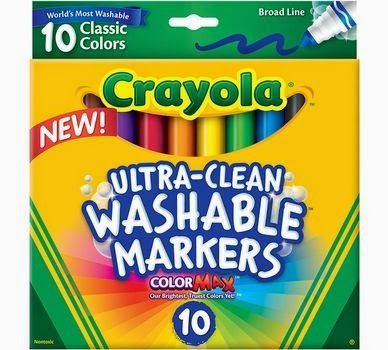 I'd love to try the Crayola clay products. My kids were sculpting with play-doh and were disappointed at how crumbly it got. Definitely on the Christmas list! 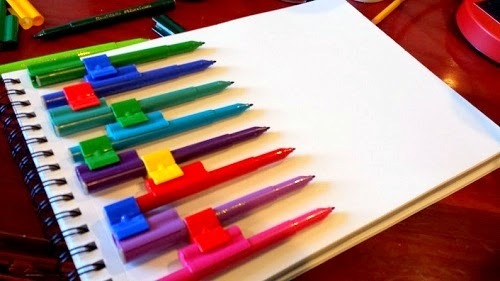 The Faber-Castell gelatos look super-cool!